America’s reigning queen of decorating, Bunny Williams, returns to her hometown of Charlottesville, Virginia, to design a charming farmhouse with Rosney Co. Architects at Bundoran Farm, a development that values nature. 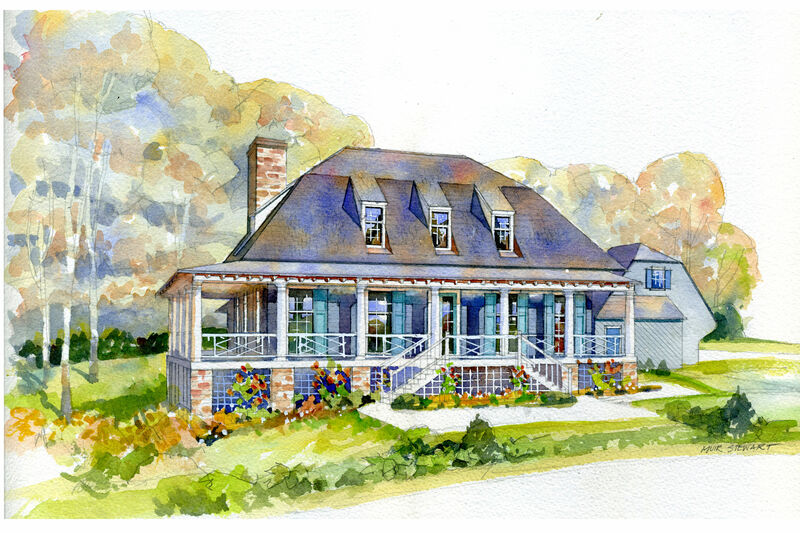 Welcome to the Southern Living 2015 Idea House in Charlottesville, Virginia. Here you will be able to see every photo of the 2015 Idea House designed by Bunny Williams a New York-based decorator who grew up not far from this Charlottesville Idea House. Take a close look at the Southern Living 2015 Idea House photos and you will see how Bunny decorated this classic Virginia farmhouse with an expert mix of antiques and contemporary pieces to make this 2015 Idea House seem like an instant home. The architects for this Charlottesville Idea House were Rosney Dixon a local firm who created the house to reflect the hunt country’s vernacular style. Welcome to the 2015 Idea House tour. “Your home should be the most comfortable place you can imagine,” says Bunny Williams. And beautiful, of course. Welcome to our 2015 Idea House, designed by Rosney Co. Architects of Charlottesville, and set in the nine-year-old, 2,300-acre conservation community of Bundoran Farm. We asked Bunny to do what she does best, so we could document every idea and tip needed for you to create the gracious home of your dreams. Read on for the frankest Southern design advice we’ve had to offer in all of our 49 years. A columned portico welcomes visitors into the home. “My mother always had a red Oriental rug [like this one] in our front hall to take Virginia’s dark red clay soil off your feet,” Bunny says. "She’d say, ‘Look at the color of your soil, and get a rug with that background.’ ” To round out the entry, Bunny also advises having a big table and a vase to hold fresh flowers or branches. Bunny says to think of the room as an “elegant man cave.” She insisted on having a TV (behind the leopard-print armchair), because “most husbands watch football.” There’s also seating for a crowd. "Heart-pine paneled rooms are ubiquitous in old farmhouses," says Rosney Co. "But avoid the glossy, honey-colored finishes from the eighties. Most wood can be restained." Shelves filled with books, not just objects, give a room character. Two seating arrangements anchor the floorspace. “To make sure that five or six people can have a good conversation, place a sofa that seats two or three with a chair on either side and another chair that can be pulled into the group.” A side table or lamp accompanies each chair. “People always need a place to put down a drink, and they want a light for reading,” says Bunny. A large room with soaring cathedral ceilings speaks to the views outside but also makes decorating tricky. “You’ve got to express the height,” says Bunny. An 8-foot-tall, antique English Regency mirror above the sofa and a medley of paintings hung museum style fill the walls and keep eyes roving up. You also need a plan for furnishing such a large space. Here, a Moroccan rug is “a needed warm texture against such a high ceiling,” says Bunny. Using what could serve as a window seat as a table filled with objects turns the windows (and the view) into a focal point. Bunny says, “When creating a classic white kitchen, be careful with the shade. It can’t seem stark—it needs to be a nice warm white.” Rosney Co. modernized the typical rambling farmhouse floor plan with an open kitchen in the center of the home. “There’s no formal dining room in the house, just the eating area in the kitchen, which opens to the porches,” they explain. “Think of the island as the breakfast table.” Rather than max out counterspace, they maximized storage with two side walls filled with floor-to-ceiling cabinets and appliances. This also freed up two walls for windows and French doors. Wooden floors, limestone counters, off-white cabinetry (Estate Collection in Glacier Pewter; wellborn.com), and cream-colored walls “infuse the kitchen’s modern design with a casual farmhouse feeling,” says Rosney Co.
Floor-to-ceiling cabinetry conceals the refrigerator on this wall and the pantry on the opposite wall. “This is where everyone will really live,” says Bunny, who insisted on wavy glass-front cabinets so “you can’t see in completely” above a buffet counter on one wall. A TV hangs on the other. For an unexpected centerpiece, try potted lettuces. Plush chairs from Bunny’s line surround a Georgia-made table (tritterfeefer.com), which Bunny set with blue-and-white plates inspired by her own china. “Stick with one color to make collecting easier,” she says. Framed photos from Bunny’s Ballard Designs collection help “disguise” the TV. Dining Room: Get the Look! “No one in my house ever actually hangs up a coat. They just drop it on a hook,” says Bunny, who installed six hooks and two cubbies that line the back hall—turning the hallway into a bona fide mudroom. “In most of our homes, we design the ‘support spaces’—like the laundry room and pantry—to connect in an out-of-the-way location in the home. We don’t want them front and center, but they should not seem like a total afterthought,” says Rosney Co. “In spaces like these, really durable floors are essential.” Here, distressed limestone stands up to the traffic. These plates add a pop of color and pattern to a hardworking space. Add texture with a decorative pillow from the Southern Living Home Collection at Dillard’s. “Navy cabinets and a ceramic graphite backsplash dress up the pantry, but the area is still functional,” says Rosney Co. Limestone counters, antique plates, and brass pineapples brighten up the space. Omitting doors on the upper cabinets (Estate Collection in Bleu Bronze; wellborn.com) kept the room from feeling tight. “The area is off the back hall by the kitchen and living room. When guests see it, they know they can help themselves,” says Bunny. “I used a lot of blues and browns in here to keep it from feeling too feminine or too masculine,” says Bunny. The toile on the club chairs drives the scheme, which is accentuated by the blue-and-beige-striped curtains (the only curtains hanging in the house). “In most rooms, I didn’t want to detract from the view, but in bedrooms you need to be able to control the light.” You also need a chair or two for sitting and bedside tables that are actually big enough to hold all of your things. A soft-blue upholstered bed, simply outfitted with a cream coverlet and white sheeting, keeps everything from getting too fussy. Bunny designed this pattern for her new collection with Lee Jofa. For a quick bedding refresh, try a patterned throw or suzani. The soft blue walls (Hinting Blue; sherwinwilliams.com) echo the bedroom’s color palette and pick up on the white marble’s dark veining. Just as they did in the kitchen, the architects ran cabinetry up the walls to maximize storage in the separate vanities that sandwich the soaking tub. Bunny treated the bath like any other room, hanging a painting over the tub. Master Bedroom: Get the Look! The designer recently added this and other beds to her Bunny Williams Home furniture line. Connecting the two upstairs bedrooms and a bunk room is an area for people to relax that’s located away from the busy downstairs. “Second-story rooms tend to be darker,” says Bunny, “So use more intense color and fabrics to brighten them.” Here, she chose vibrant and light-hearted apple greens and blues. Pajama Lounge: Get the Look! The green bed, chair, and sheet details contrast with the purple, while the coverlet’s orange tones pep up the palette. Here, she fabricated a valance to hang behind the bed and upholstered the headboard with one of her new fabric designs. “Purple can be hard, but lavender is great. It works with robin’s-egg blue and also apple green. If it’s pale enough, it can even be a neutral,” says Bunny. Girl's Bedroom & Bath: Get the Look! This 1 1/2-story house is flanked by two chimneys. Most of the main areas connect to outdoor areas, and dormer windows create a lot of space without much height. “Lower houses fit better with the land,” says Rosney Co. These southeast-facing porches capture sunrises, filling the kitchen with morning light. A vaulted ceiling echoes the adjacent living room’s cathedral ceiling. These wicker chair frames (Laurel Lounge Chair; ballarddesigns.com) remind Bunny of tree bark. The dining terrace provides another spot for alfresco meals. A large oversize soapstone sink designed by Rosney Co. turns the dogtrot between the garage and back door into a beautiful, utilitarian space. “It’s a great place to arrange flowers or to wash up before going inside,” says Rosney Co.